Line of sight, we measured 700ft+ range vs. ~150ft range (in default setting) of 1st Gen sensor tag. This means the long range sensor tags will work extremely well anywhere in your house, no matter if it is inside a metal fridge, behind a metal door, or inside mail box in your front yard. We did this by a combination of increasing transmit power to FCC limit, using optimal frequency modulation index, 5x more accurate frequency reference (10ppm) than our 1st generation tags, and new frequency control techniques to allow narrow receiver bandwidth of 20kHz to filter more noise. 20kHz is 1000 times narrower than the bandwidth of WiFi. with advanced DSP-based filtering, 1000 times less noise at receiver output results in higher sensitivity and longer range, even at much lower transmit power than that of WiFi to achieve longer battery life / smaller battery size. From the Web app, click More... and choose Receiver Mode... to select between Low Power and Setup Mode. In both modes, the radio is turned on for only briefly every 0.7~4 seconds to poll for user commands such as "arm" or "beep". 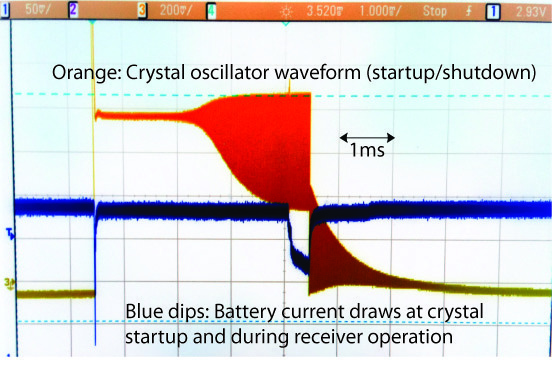 This interval, configurable from wireless settings, directly affects tag response time experienced by user vs. stand-by power hence battery life trade-off. 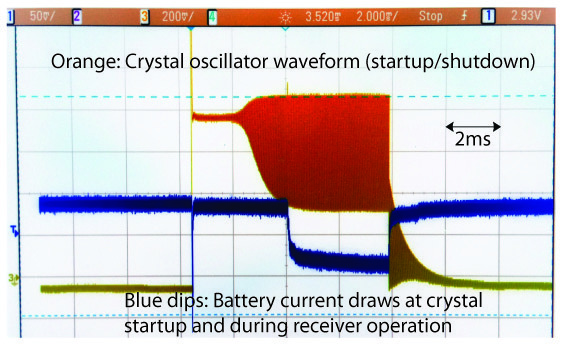 However, in Low Power mode, the receiver is operational for much shorter period (0.5~1ms vs. 4ms) just enough to accurately measure radio signal strength within the channel bandwidth. Then, unless it is increased vs. last few cycles, the radio is turned off immediately. Our measurement showed that this sacrifices range by less than half, in return the radio stand-by power consumption is reduced by more than 4x vs. the normal setup mode used for 1st generation tags. Long range radio comes at a price: when transmitting at max power, it drains the battery 3x faster than the old version tags. However, most of the cases the tag does not need to transmit at max power. 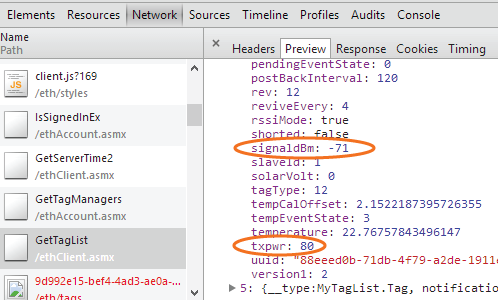 When tag manager receives a transmission from the tag, and if the signal strength is higher than -70dBm (4 bars) it automatically calculates how much the tag needs to reduce its power and sends this information back to the tag. On the other hand, when the tag cannot get acknowledgement from the tag manager, it slightly increases its configured transmit power and tries again. To see at what transmit power the tag is currently transmitting, press F12 (from Chrome) to open the console, F5 to refresh, find "GetTagList" and open the information the Cloud server returned and look for the line "txpwr" under the tag of interest. This value ranges from 16 to 255 (max power).